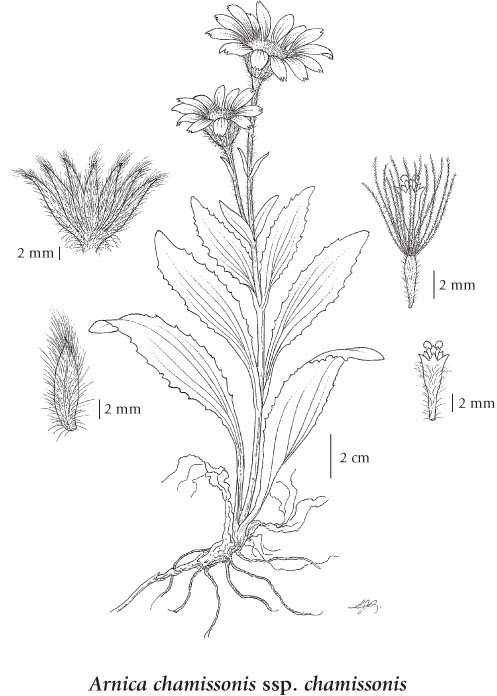 Perennial herb from a long rhizome; stems erect, solitary, occasionally branched below the middle, sparsely to densely long-hairy, becoming glandular above, 20-100 cm tall. Basal leaves often deciduous by flowering time; stem leaves 5-10 pairs, rarely only 4 pairs, opposite, 3-30 cm long, 0.3-8 cm wide, lanceolate to oblanceolate, 3-5 veined, sparsely to densely long-hairy to silvery-hairy, stalked below, not stalked above, entire to toothed, reduced upward. 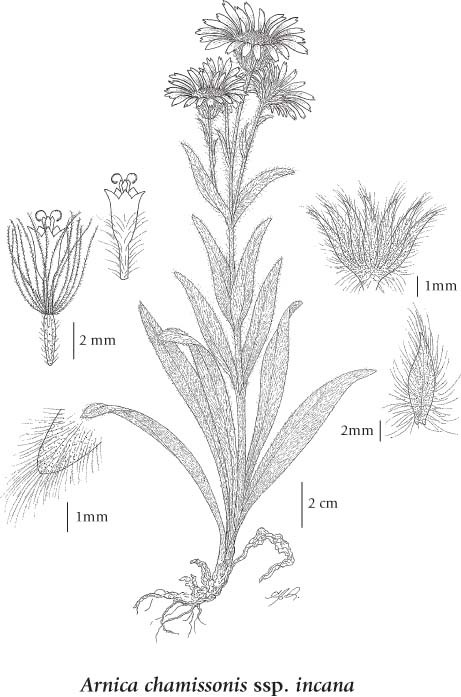 Heads with ray and disk flowers, 5-15, rarely as few as 1, usually erect, the bases sparsely to densely long-hairy with white hairs, often glandular; involucres 8-15 mm tall; involucral bracts lanceolate, rounded to abruptly pointed, sparsely to densely long-hairy with a conspicuous tuft of whitish hairs at the apex; ray flowers yellow, usually 10-16, apical teeth conspicuous; disk flowers yellow. Achenes 3.8-6 mm long, cylindric, short-hairy and glandular to subglabrate; pappus tawny or whitish, finely-barbed or somewhat feathery. Three fairly well-marked taxa may be recognized in BC. 1. Pappus finely-barbed, whitish to straw-colored; involucres densely long-hairy but without unstalked glands, the basal hairs with less prominent crosswalls; leaves usually toothed and long-stalked, at least below.